Hello Friends! It's me, Leslie and it's time for Color Me Pretty again. Are you ready to see what I've come up with this time around? Today I am using different shades of mauve, magenta and deep purple combined with lots of aged paper for a more nostalgic feel. What do you think? I also wanted to paint some Anni Albers (German textile artist and printmaker, read more here) inspired patterns in watercolor to bring geometric elements to the mix as I always like it when different styles converge, don't you? 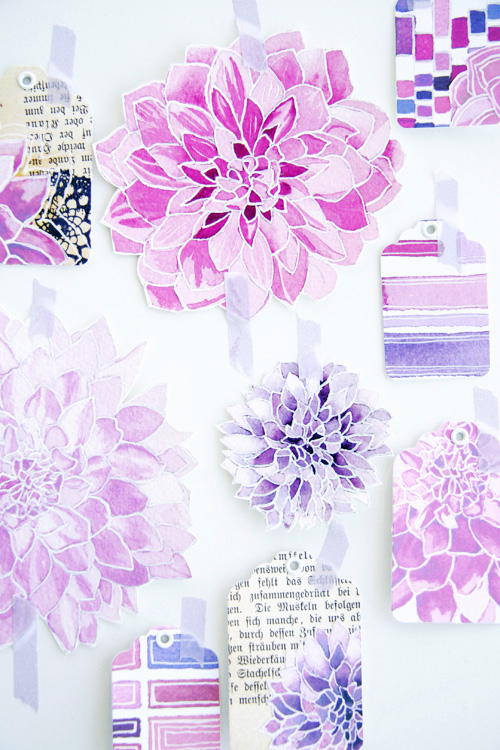 Some of the dahlias I photographed also inspired me to paint a few which brings a softness to some crafts I made for you. I really hope you enjoy this little investigation. 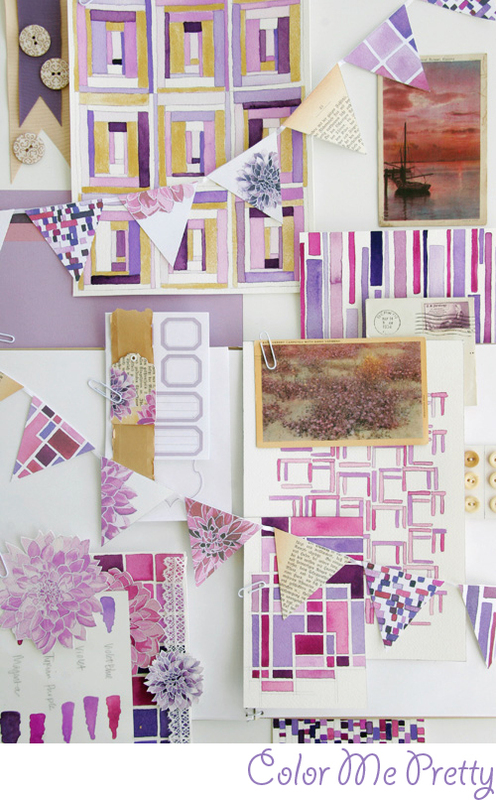 Decorating ideas: As you know vintage papers of any kind can provide an interesting texture to your home decor. Old books with worn spines on a shelf, maps of cities you love or images from bygone eras can help to create more flavor to any room. I have noticed that vintage post cards are widely available at my local flea market and they can be an instant way to add color and a little bit of history to your walls. It is also fun to turn them over and show the old handwriting and stamps on the back. I could imagine some tacked in a group or clipped to a string hung on a wall, some showing the images and some showing the back. The postcards I picked up were fifty cents to a dollar with some dating back to 1910. DIY Ideas: Garlands (above) are featured everywhere these days but they are also nostalgic and so sweet, I just had to try making one for you in this color scheme! After scanning in some of my watercolors I then printed them out on textured paper, cut the triangles, and then quickly glued them to a ribbon. I hope you like it and I will try to sew one next time! Another DIY idea -- Lastly, I scanned in some old German text book pages to use as a background texture for some of the photographs and for some little gift tags that I made. I just didn't feel right about cutting up the book for my crafts! Are you the same way when it comes to cutting up books? It's hard, isn't it?